"Happiness depends on ourselves." More than anybody else, Aristotle enshrines happiness as a central purpose of human life and a goal in itself. As a result he devotes more space to the topic of happiness than any thinker prior to the modern era. Living during the same period as Mencius, but on the other side of the world, he draws some similar conclusions. That is, happiness depends on the cultivation of virtue, though his virtues are somewhat more individualistic than the essentially social virtues of the Confucians. Yet as we shall see, Aristotle was convinced that a genuinely happy life required the fulfillment of a broad range of conditions, including physical as well as mental well-being. In this way he introduced the idea of a science of happiness in the classical sense, in terms of a new field of knowledge. 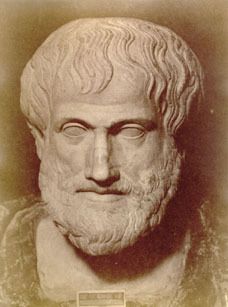 Essentially, Aristotle argues that virtue is achieved by maintaining the Mean, which is the balance between two excesses. Aristotle’s doctrine of the Mean is reminiscent of Buddha’s Middle Path, but there are intriguing differences. For Aristotle the mean was a method of achieving virtue, but for Buddha the Middle Path referred to a peaceful way of life which negotiated the extremes of harsh asceticism and sensual pleasure seeking. The Middle Path was a minimal requirement for the meditative life, and not the source of virtue in itself. 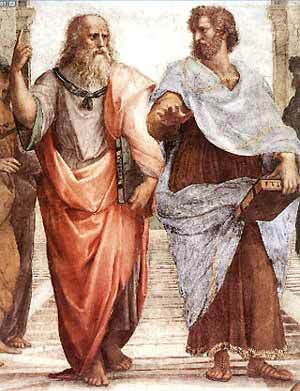 Aristotle (right) and Plato in Raphael's fresco, 'The School of Athens', in the Apostolic Palace in the Vatican. Aristotle was the first to classify areas of human knowledge into distinct disciplines such as mathematics, biology, and ethics. Some of these classifications are still used today, such as the species-genus system taught in biology classes. He was the first to devise a formal system for reasoning, whereby the validity of an argument is determined by its structure rather than its content. Consider the following syllogism: All men are mortal; Socrates is a man; therefore, Socrates is mortal. Here we can see that as long as the premises are true, the conclusion must also be true, no matter what we substitute for "men or "is mortal." Aristotle's brand of logic dominated this area of thought until the rise of modern symbolic logic in the late 19th Century. Aristotle was the founder of the Lyceum, the first scientific institute, based in Athens, Greece. Along with his teacher Plato, he was one of the strongest advocates of a liberal arts education, which stresses the education of the whole person, including one's moral character, rather than merely learning a set of skills. According to Aristotle, this view of education is necessary if we are to produce a society of happy as well as productive individuals. One of Aristotle's most influential works is the Nicomachean Ethics, where he presents a theory of happiness that is still relevant today, over 2,300 years later. The key question Aristotle seeks to answer in these lectures is "What is the ultimate purpose of human existence?" What is that end or goal for which we should direct all of our activities? Everywhere we see people seeking pleasure, wealth, and a good reputation. But while each of these has some value, none of them can occupy the place of the chief good for which humanity should aim. To be an ultimate end, an act must be self-sufficient and final, "that which is always desirable in itself and never for the sake of something else" (Nicomachean Ethics, 1097a30-34), and it must be attainable by man. Aristotle claims that nearly everyone would agree that happiness is the end which meets all these requirements. It is easy enough to see that we desire money, pleasure, and honor only because we believe that these goods will make us happy. It seems that all other goods are a means towards obtaining happiness, while happiness is always an end in itself. Human: what is it that makes human beings different from the rest of the animal kingdom? Aristotle answers: Reason. Only humans are capable of acting according to principles, and in so doing taking responsibility for their choices. We can blame Johnny for stealing the candy since he knows it is wrong, but we wouldn't blame an animal since it doesn't know any better. It seems that our unique function is to reason: by reasoning things out we attain our ends, solve our problems, and hence live a life that is qualitatively different in kind from plants or animals. The good for a human is different from the good for an animal because we have different capacities or potentialities. We have a rational capacity and the exercising of this capacity is thus the perfecting of our natures as human beings. For this reason, pleasure alone cannot constitute human happiness, for pleasure is what animals seek and human beings have higher capacities than animals. The goal is not to annihilate our physical urges, however, but rather to channel them in ways that are appropriate to our natures as rational animals. Another example is the taking of drugs, which is becoming more and more of a problem in our society today. For a fairly small price, one can immediately take one’s mind off of one’s troubles and experience deep euphoria by popping an oxycontin pill or snorting some cocaine. Yet, inevitably, this short-term pleasure will lead to longer term pain. A few hours later you may feel miserable and so need to take the drug again, which leads to a never-ending spiral of need and relief. Addiction inevitably drains your funds and provides a burden to your friends and family. All of those virtues — generosity, temperance, friendship, courage, etc. — that make up the good life appear to be conspicuously absent in a life of drug use. Aristotle would be strongly critical of the culture of "instant gratification" which seems to predominate in our society today. In order to achieve the life of complete virtue, we need to make the right choices, and this involves keeping our eye on the future, on the ultimate result we want for our lives as a whole. We will not achieve happiness simply by enjoying the pleasures of the moment. Unfortunately, this is something most people are not able to overcome in themselves. As he laments, "the mass of mankind are evidently quite slavish in their tastes, preferring a life suitable to beasts"
(Nicomachean Ethics, 1095b 20). Later in the Ethics Aristotle draws attention to the concept of akrasia, or weakness of the will. In many cases the overwhelming prospect of some great pleasure obscures one's perception of what is truly good. Fortunately, this natural disposition is curable through training, which for Aristotle meant education and the constant aim to perfect virtue. 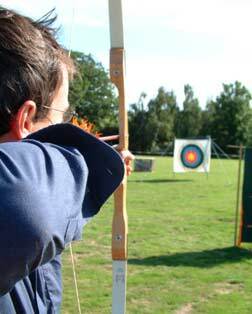 As he puts it, a clumsy archer may indeed get better with practice, so long as he keeps aiming for the target. There is yet another activity few people engage in which is required to live a truly happy life, according to Aristotle: intellectual contemplation. Since our nature is to be rational, the ultimate perfection of our natures is rational reflection. This means having an intellectual curiosity which perpetuates that natural wonder to know which begins in childhood but seems to be stamped out soon thereafter. For Aristotle, education should be about the cultivation of character, and this involves a practical and a theoretical component. The practical component is the acquisition of a moral character, as discussed above. The theoretical component is the making of a philosopher. Here there is no tangible reward, but the critical questioning of things raises our minds above the realm of nature and closer to the abode of the gods. For Aristotle, friendship is one of the most important virtues in achieving the goal of eudaimonia (happiness). While there are different kinds of friendship, the highest is one that is based on virtue (arête). This type of friendship is based on a person wishing the best for their friends regardless of utility or pleasure. Aristotle calls it a “... complete sort of friendship between people who are good and alike in virtue ...” (Nicomachean Ethics, 1156b07-08). This type of friendship is long lasting and tough to obtain because these types of people are hard to come by and it takes a lot of work to have a complete, virtuous friendship. Aristotle notes that one cannot have a large number of friends because of the amount of time and care that a virtuous friendship requires. Aristotle values friendship so highly that he argues friendship supersedes justice and honor. First of all, friendship seems to be so valued by people that no one would choose to live without friends. People who value honor will likely seek out either flattery or those who have more power than they do, in order that they may obtain personal gain through these relationships. Aristotle believes that the love of friendship is greater than this because it can be enjoyed as it is. “Being loved, however, people enjoy for its own sake, and for this reason it would seem it is something better than being honoured and that friendship is chosen for its own sake” (Nicomachean Ethics, 1159a25-28). The emphasis on enjoyment here is noteworthy: a virtuous friendship is one that is most enjoyable since it combines pleasure and virtue together, thus fulfilling our emotional and intellectual natures. Aristotle’s ethics is sometimes referred to as “virtue ethics” since its focus is not on the moral weight of duties or obligations, but on the development of character and the acquiring of virtues such as courage, justice, temperance, benevolence, and prudence. And anyone who knows anything about Aristotle has heard his doctrine of virtue as being a “golden mean” between the extremes of excess and deficiency. Courage, for example, is a mean regarding the feeling of fear, between the deficiency of rashness (too little fear) and the excess of cowardice (too much fear). Justice is a mean between getting or giving too much and getting or giving too little. Benevolence is a mean between giving to people who don’t deserve it and not giving to anyone at all. Aristotle is not recommending that one should be moderate in all things, since one should at all times exercise the virtues. One can’t reason "I should be cruel to my neighbor now since I was too nice to him before." The mean is a mean between two vices, and not simply a mean between too much and too little. Aristotle’s doctrine of the mean is well in keeping with ancient ways of thinking which conceived of justice as a state of equilibrium between opposing forces. In the early cosmologies, the Universe is stabilized as a result of the reconciliation between the opposing forces of Chaos and Order. The Greek philosopher Heraclitus conceived of right living as acting in accordance with the Logos, the principle of the harmony of opposites; and Plato defined justice in the soul as the proper balance among its parts. Like Plato, Aristotle thought of the virtuous character along the lines of a healthy body. According to the prevailing medical theory of his day, health in the body consists of an appropriate balance between the opposing qualities of hot, cold, the dry, and the moist. The goal of the physician is to produce a proper balance among these elements, by specifying the appropriate training and diet regimen, which will of course be different for every person. Happiness cannot be achieved until the end of one's life. Hence it is a goal and not a temporary state. Happiness depends on acquiring a moral character, where one displays the virtues of courage, generosity, justice, friendship, and citizenship in one's life. These virtues involve striking a balance or "mean" between an excess and a deficiency. Ackrill, J. (1981). Aristotle the Philosopher. Oxford: Oxford University Press. A comprehensive introduction to Aristotle. Adler, Mortimer (1978). Aristotle for Everybody. New York: Macmillan. A popular exposition for the general reader. Aristotle, Nicomachean Ethics (2004), ed. Hugh Treddenick. London: Penguin. The main source for Aristotle's ethics. Aristotle, Politics (1992), ed. Trevor Saunders. London: Penguin. Aristotle situates ethics within the discussion of the best constitution. A History of Greek Philosophy, Vol. 6. Cambridge University Press. One of the standard classics of the history of Greek philosophy. Picture credit: Archer and target by aroncb / SXC.hu. I really like this piece in terms of style and content and in short demonstrates the brilliance of an ancient thinker and his effect on society that will live on. The website is very good. This is very well put. I read the Nicomachean Ethics years ago and adopted it as my personal philosophy of happiness. As I look back from her, I see that yes I am happy with the choices I have made to this point. I have balance…. This was a very well written and interesting article. I write a lot about happiness and am very intrigued by Aristotle and his teachings. I was actually searching for the origins of the word ‘pursuit’ when I found your article. I understand that pursuit as it was originally written and in the context of happiness, was more about the practice of happiness, rather than the chasing after. Great article. Thanks a lot. This is so well written and such an accessible introduction to anyone interested in Aristotle’s thoughts. I particularly liked how the author weaved in contemporary examples.